Baked donuts are now a weekend treat at the Shugary house. They literally take about 10 minutes to prepare, 12 minutes to bake. 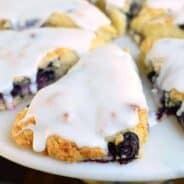 Clean up your mess while they are baking and it’s an easier breakfast than eggs, french toast and bacon! Plus, once you bite into that dough, you know this was the right choice. As you can see, my New Year’s resolutions did not include giving up chocolate. Or sweets. I promise. 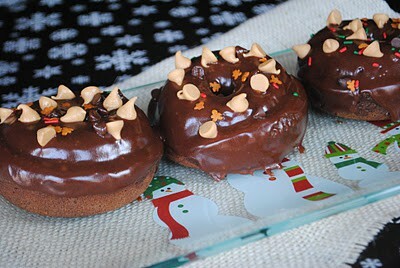 this is all sorts of bad but so good at the same time..chocolate pb in a donut — you’re killing me!! i totally want some now!! Yum! Thanks for the recipe. I have a doughnut pan I don’t use nearly enough! These look delicious! I’m thinking we may have to start a weekend tradition too! Donuts have become a staple in our house too…hooray for donut pans!!! 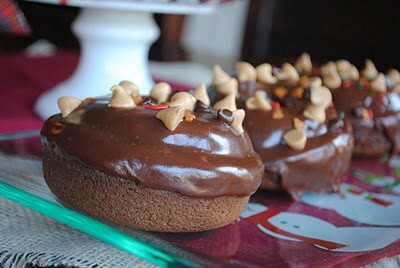 I would totally break my diet for a few of these bad boys…chocolate and peanut butter glaze, oh yum!!!! You had me at peanut butter and chocolate! By far one of the best flavor combinations! My son would totally loves these. Plus, chocolate and peanut butter is always such a great combo! Should have known I would end up here when I clicked on the link over at Wow Me Wednesday. Just bought two new doughnut pans. I think this will be my first recipe to try. Thanks for sharing. Guess it’s time to buy a donut pan. This look insanely good! 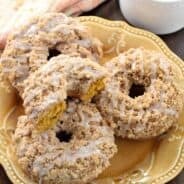 I’ve struggled to find good baked donut recipes so I’m going to try this on Saturday. These look dangerous. Thankfully I like flirting with dangerous things rhyming with Shmocolate Meanut Futter Ronuts. 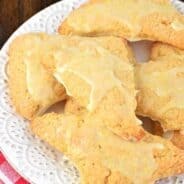 Can I ask a question — how do you get the “if you enjoyed this recipe you may also enjoy…” links on your posts? Do you manually do that? I am SO in love with this recipe. Is it breakfast or dessert? Better yet, it’s both! Oh my, I will have to break my new year’s resolution for this recipe! 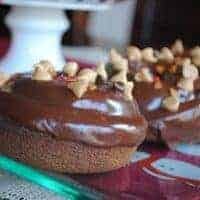 You had me at chocolate and peanut butter, this looks delicious!